Dubai, UAE, April 08, 2019: Great news for tea lovers – Starbucks is adding the first ever tea variety to its hugely popular ready-to-drink Frappuccino range. Starbucks Frappuccino Matcha Tea features the delicate flavours of single origin Japanese green matcha tea carefully blended with silky fresh milk. The result? A deliciously creamy and colourful drink bursting with fun, flavour and plenty of personality. It’s also completely coffee-free. 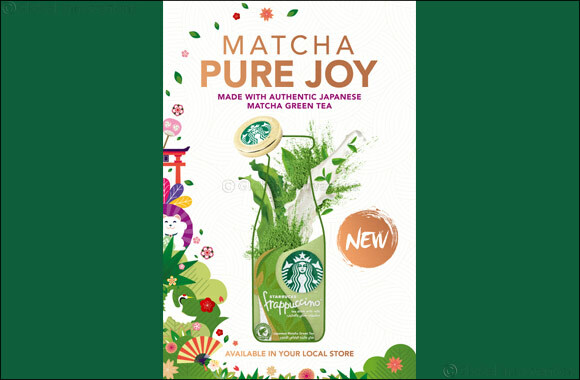 Better still, there’s no way anyone can miss Frappuccino Matcha Tea on the shelves thanks to the eye-catching shade of natural pastel green that can be seen through the glass bottle packaging. It’s an easy and convenient way to enjoy matcha whilst you’re out and about. Starbucks Frappuccino Matcha Tea is made with high-quality, single-origin Japanese matcha – a finely ground, light green powder that has a soft and delicate flavour and has been at the heart of Japanese Tea Ceremonies for centuries. The tea’s gorgeous green colour and various health benefits have also made it extremely popular with young consumers. Using matcha as an ingredient is a growing trend across the world: having already introduced it into our Starbucks stores, now it’s making its foray into the Starbucks chilled drinks range.